After World War II ended, the triumphant nations began to reexamine the results of the war and all of them decided to upgrade their artillery firepower. This meant that lighter weapons such as the 105mm and 122mm howitzers were soon looked at as regimental artillery and 152mm and 155mm howitzers were now division level weapons. The F.F. Petrov design bureau at Plant No. 9 in the Soviet Union began work on this subject, and in 1955 introduced a “duplex” weapon of the type preferred by the Soviets: a long range 122mm gun dubbed the D-74, and a 152mm gun-howitzer called the D-20. Both shared a great number of carriage parts and systems (hence the term “duplex” as they got a great deal of interchangeability from the design). But while the D-74 was seen as too weak a weapon for what the Soviets foresaw as their artillery needs (they went with 130mm and 152mm guns instead) it was widely sold to client states and was popular in the Middle East and Vietnam. The D-20 on the other hand became the core of divisional artillery regiments, with regiments eventually numbering three battalions or 54 pieces. At the army/front level, brigades of four battalions or 72 tubes were soon added for additional firepower. The D-20 only began to lose favor in 1973 when the first self-propelled versions of the gun, the 2S3 Akatisya, began to reach units. The D-20 is a conventional weapon with a normal maximum range of over 17,000 meters and which can fire a wide variety of ammunition to include HE-FRAG, concrete penetrating, flechette (“shrapnel” to the Soviets) and the “Krasnopol’” guided projectile. Prime mover is the family of Ural 375/375D/4320 6 x 6 5 ton trucks. Trumpeter has been aggressively going through the entire Soviet arsenal and now offers kits of both the D-74 (Kit No. 02334) and the D-20. This is an extremely detailed kit of the gun and offers a number of build options. 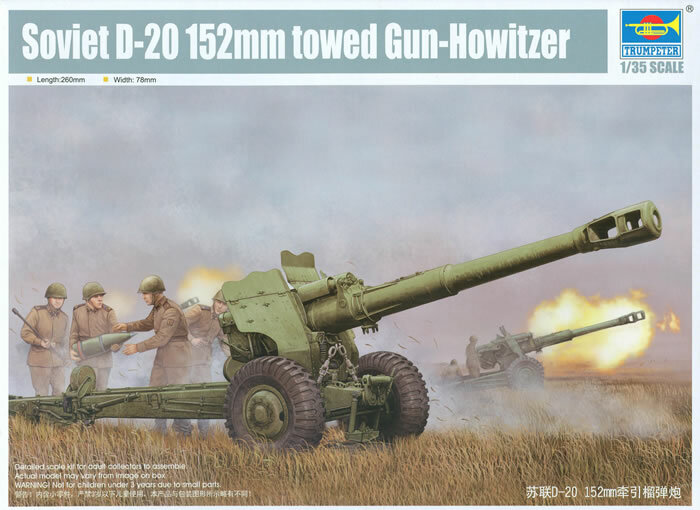 Note that the term “gun-howitzer” is a Soviet term which covers weapons longer than a howitzer (25 calibers or less) and shorter than a gun (usually 40 calibers or longer). The D-20 is 34 calibers in length (152.4 x 34 = about 5200 mm long). Construction begins with the center base of the carriage and wheel axles. The baseplate (C1) is added as well. Step 3 covers the breech assembly and breech block and 4-5 the recoil mechanism. Step 8 is the assembly of the barrel and muzzle brake. These are two part styrene assemblies but with the quick use of a Flex-i-File can speedily be smoothed down. Step 9 is the assembly of what the Soviets call the “recoiling mass” (e.g. the gun proper) and 10 mounts the gun to the upper carriage. 11 attaches the lower carriage, and 12-17 cover assembly and installation of the trails. Note that whereas the trails can be assembled with the spades stowed or in place the directions only cover the towing configuration, which is a bit of a shame. Likewise, in step 20 the auxiliary traversing wheels are also only shown in the stowed position. The shield options are for identical shapes, but one is single piece plates and the other has folding upper sections (molded as erect). Final assembly is covered in Step 25 and 26 provides for the crate with its single round of 152mm HE-FRAG ammunition (projectile and charge). If you want to display the weapon in a firing position, you will need some good photos of the gun in action and also after-market ammo and crates. A full crew is about 11 men for this weapon as it is quite heavy and needs a lot of muscle to move and feed. Overall this kit is more than its directions would indicate but it will take some extra research to see how to get it set up in a firing position. You also can find all of the various color combinations used by the nations which purchased the D-20.